Transmuting the entanglement of situations, contexts, artifacts and people, designers mediate the relationship between ‘what could be’ and ‘what is’. All design, then, has an implicit relationship with the future. Latency will always exist as part of this relationship, between the inception of a design concept, development and delivery of that concept, and the manifestation of that concept's potential impact on the world. As we move further into the heart of the Digital Revolution these periods of latency decrease, whilst the breadth and depth of potential impacts increase. Always an arm's length away, but with a velocity and mass greater than at any point in history, the momentum of the future today is greater than ever before. 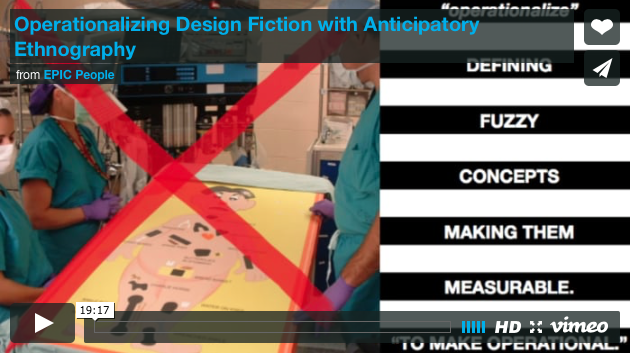 This paper describes the practicalities of operationalizing design fiction, using anticipatory ethnography, in order to illuminate and explore the implications of plausible near futures and in doing so allowing designers and their designs to match the velocity of the future before critical impacts occur. By harnessing designers’ speculation can we make the future's ‘what is’ better than simply ‘what could be’?